How do you make the Revolutionary War cool for high schoolers? Develop a game about the subject and then make your students play it. History is often pretty dry stuff - I would know, since I majored in that subject the first time through college. It's particularly dull in high school, when there's not a lot of topic flexibility. So New Jersey teacher David Allocco decided to make the topic of the Revolutionary War a little more accessible by creating an original videogame that puts players in the middle of the conflict. The game, Choosing Sides: The American Revolution in Bergen County , casts players as Hackensack resident John Van Dunk, and follows them as they guide him through the war. It sounds like this is an open-path adventure game, since Van Dunk talks to other people in Bergen County and has to decide whether or not he'll be a British Loyalist or an American Revolutionary. Along the way, players meet and interact with real historical figures. Allocco's students would spend two days playing the game and were graded on a journal they maintained, explaining why they made their decisions. According to the teacher, he was surprised by how many of the teens decided to side with the British. 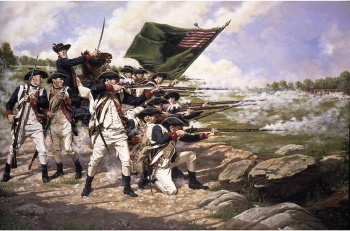 However, the decision makes sense: Many Redcoats were based out of New York and often conducted raids into the nearby areas in New Jersey, and the students operated as loyalists out of a desire to simply survive. Choosing Sides sounds like a great way to make history interesting for students, and it also doesn't sound like Allocco is finished making educational videogames. The man has stated that he wants to create more games that put students in "key moments" of American history.